This is an exciting new brush that we requested from Red Creek. The ultrafine steel used in this brush has previously only been used in little mini-brushes because of the expense, but we thought we could make it work in a full rectangular hand brush size. When we evaluate brushes we find that the bristle material, diameter, length, group density and spacing all have a profound effect on the function and feel of the brush. This configuration is the most effective and efficient brush we've ever had for cleaning paraffin from the base structure of the ski. This brush does not leave the ski base polished and shiny, but it doesn't harm the base in any way or leave any microscratches, and the base polishes very quickly after using this brush. This bristle configuration works best on harder paraffins, though it is also very effective on soft paraffins when the ski is cooler than room temperature. Soft paraffins at room temperature are a smeary mess with any brush, but are easier to deal with using a slightly coarser brush like the Oval Straight Steel (which is the same material slightly longer at 0.08mm bristle diameter). When we asked KG Lundkvist whether this brush was possible to make, he said "yes, I made a prototype some years ago. But there is a problem with durability." Uh oh. So we asked, "does it wear out really quickly?" "No, the damn thing never wears out". So. Durability should be good! 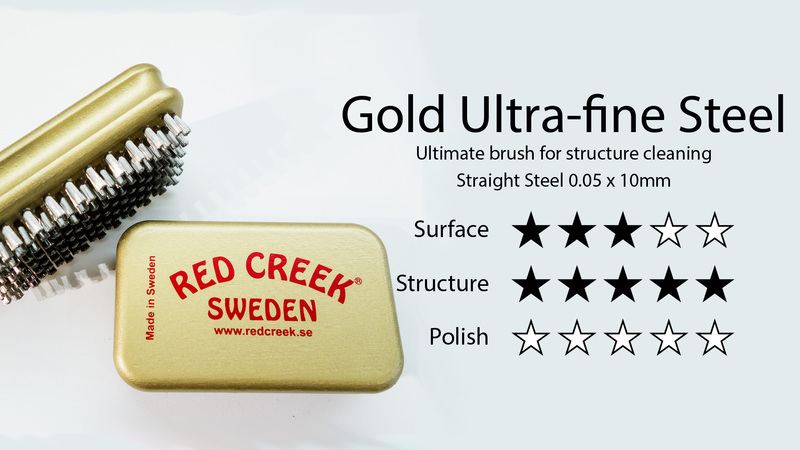 In our very popular three-brush "kit" line-up this brush would replace the Vauhti Brass, or previous Red Creek fine oval steel brush. It is efficient enough to eliminate the need for the horsehair scrubbing first step in most circumstances.